-- Capable of USB peripherals, such as USB ethernet adapter, hubs, keyboard, audio devices etc. 1. This adapter doesn't support USB device(hubs, keyboard, etc.) over 100mA current. 2. 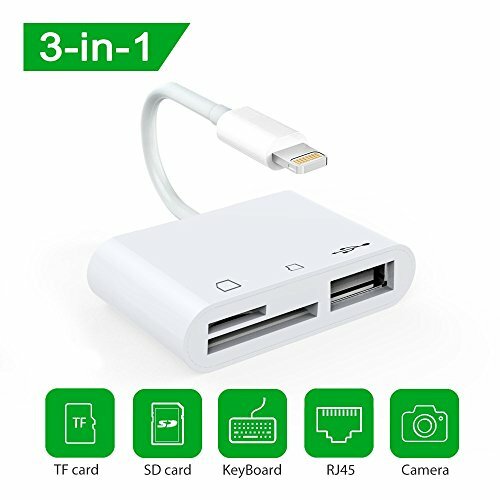 SD/TF card reader and USB interface cannot be used at the same time. 3. If photos were not taken by the digital camera, use your computer, create a folder called "DCIM" to the root of your memory card. Copy the photos and videos into the DCIM folder. Rename each photo and video file as "IMG_XXXX", where XXXX is a unique number. For example, if you had one JPG file and one .MOV file, name them "IMG_0001.JPG" and "IMG_0002.MOV". -- If you have any questions or require any further information, please do not hesitate to contact us at: customer_support@raycue.com, we will take immediate action to assist you and make our every effort to solve the issues you raised. 【Plug & Play】-- No need to download any app, it will automatically opens the Photos app when connected with camera or memory card, you can choose photos or videos you like to import. 【Super Speed Transmission】-- It can easily import the photos and videos to your iPad/iPhone with USB 2.0 speed, up to 14MB/S~16MB/S, share with your families or friends at anytime. 【Attention Please】--1. This card reader does not support USB devices over 100mA current. 2. Three interfaces only can use one at a time. 3. It is "One-Way-Transfer".